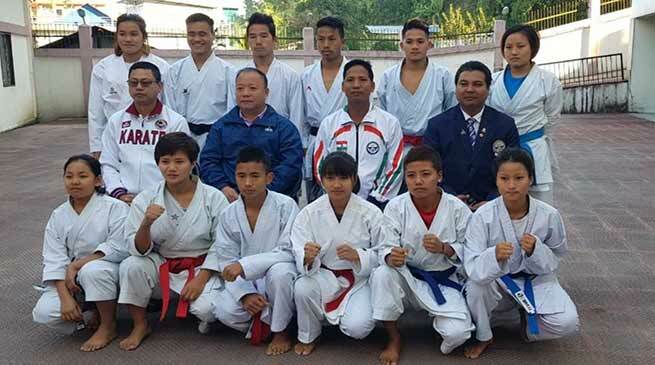 13 member team of Karate-kas from Arunachal Pradesh left to Mumbai to join the national contingent to take part in the 9th commonwealth Karate championship in South Africa. The team will participant in the 9th Commonwealth championship which is scheduled to be held at at Durban in South Africa from November 29 to December 2nd. The team consist of Bulang Marik, Mesom Singhi, Bamang yamu, Goda Asha, Loder Tong, Mojum Dodum, Raja Yangfo, Samem Romat, Johny Mangkhiya, Yamung Gamnu, Deepak Jamoh, Kina Sipa, Lipen Ete. Arunachal Karate-Do Association (AKA) President Shihan Likha Tara in a press communiqué said that on the basis of medal winner in last KAI national Karate Championship the players have been shortlisted from AKA for 9th commonwealth Karate Chapionship-2018 to be held at Olive convention centre Ice arena, South Africa from 29 November to December 2nd. Tara while inform that all preparation and practice were made earlier and today are leaving to Mumbai to join the national contingent on November 26. The players will play in four category which include sub-junior, cadet, junior and senior category. Tara added.